It’s a quote we’re all very familiar with, often splayed on inspirational posters hanging in your therapist’s office or memes (with gratuitous cat photo, of course) crowding up your Facebook feed. While this may be the case for some, for chef Stephen Jones, it’s quite the opposite. For the burly, linebacker-esque Jones, he doesn’t just go through open doors, he busts through them…with no looking back. No stranger to the Valley’s dining scene, Jones has held posts at an impressive list of restaurants: Water Grill (Southern California), Nobu and Bradley Ogden (Las Vegas), MK (Chicago), BLT Steak, Tarbell’s, Latilla at the Boulders, Blue Hound Kitchen & Cocktails, and even a short stint at Bootleggers. But his latest venture is more than just a venture, it’s his passion. This April, Jones will celebrate the one-year anniversary of DeSoto Central Market, the urban food hall he opened with Connelly on the corner of Roosevelt and Central. Unlike anything Phoenix—the Valley for that matter—has seen before, it follows in the footsteps of such food markets as L.A.’s Grand Central Market or Gotham West Market in New York City. Desoto Central Market is restaurant hub, speakeasy, retail space, entertainment venue, dance hall, yoga studio, crafts classroom, and communal gathering place where anything goes, especially the food. 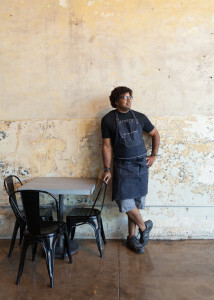 Jones says the menu—and its creative dish names—is inspired by food slaves in the South created during the Civil War. “We’re teaching people about American food—what it was, what it is and what it can be,” he says. While Jones gets most of his ingredients here—thanks to local farms and purveyors such as McClendon’s Select and Homeboys Hot Sauces—he does source a few things straight from the deep South. Jones says the menu has slight changes every other month or so, but some things—like the chicken skin po’ boy and Buffalo-style cauliflower—have a permanent spot. And while the restaurant is just a few months old, that isn’t stopping him from seeking out that next open door. “The Larder will evolve into something that will be bigger than me and that’s OK, he says.